Our aluminium bi-fold doors in Brighton, Tonbridge and Redhill and surrounding areas are great quality and perfect for any home. Architecturally, these aluminium bi-fold doors are truly market leading meaning they excel in thermal efficiency, security, durability and design. Our doors are manufactured to the highest specifications; we are a leading supplier of aluminium bi-fold doors because each one is expertly engineered. Sleek and stylish, these aluminium bi-fold doors are flexible in configuration and can be tailored to your needs and requirements. To get your competitive, free and instant online quote, simply head over to our easy to use our online quoting engine. You’ll be able to find a price that suits you in a prompt and efficient way. 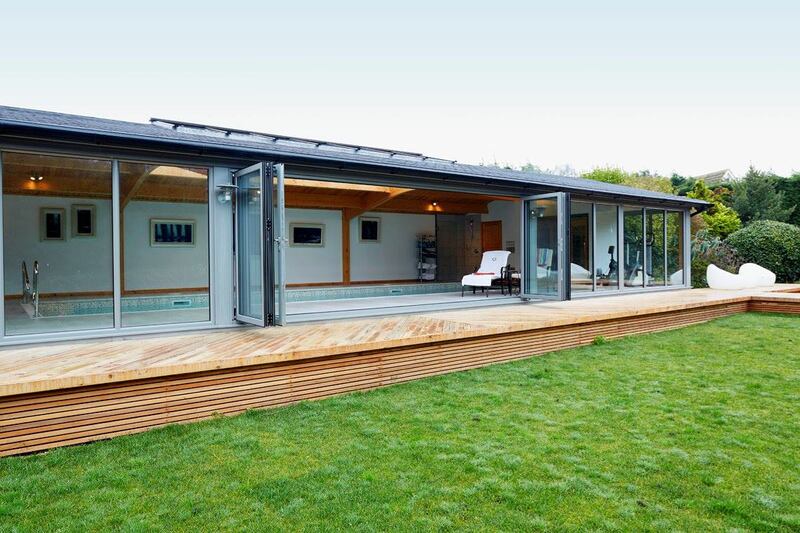 Our aluminium bi-fold doors in Uckfield are outstanding where functionality is concerned. They open in and out to create a seamless transition between your home and the open outdoors. They are designed by leading manufacturers, who have sufficed stringent testing measures to prove their quality in their products. These aluminium bi-fold doors maximise your space available, with the option of a corner bi-fold design for fully extending your property. Our unique aluminium bi-fold doors feature a stainless-steel wheel and track, which makes sliding motion effortless. Low thresholds allow easy disabled access. Notably, these doors are credited by Secured by Design, tested for quality and performance. Our doors are fitted with high quality locks for firmer security. The safe gaskets prevent trapped fingers, whereas strong magnets hold the doors in place to revoke slamming. Customise the rebate with chamfered beads. Continuous hinges also allow for a seamless finish. We too have a selection of panes to grasp. 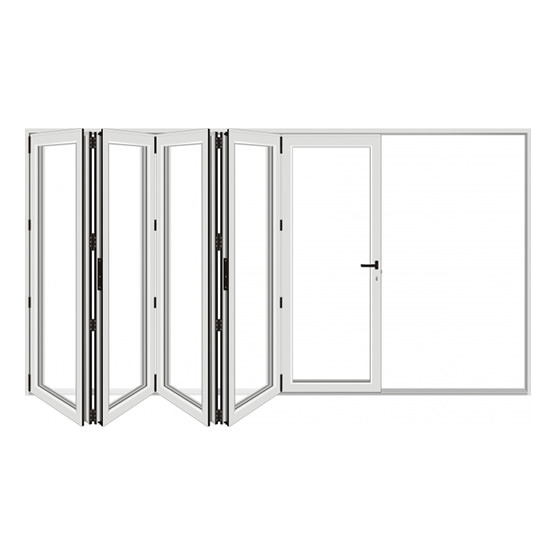 Bi-fold doors come in configurations ranging from two to eight door sets. ­­The corner option comes in multiple opening, folding and sliding configurations. We offer a standard set of colours to customise your bi-fold doors, and additional bespoke RAL colours. Aluminium bi-fold doors possess the aesthetics of wood without the labour. Durability standards are greater than uPVC too. 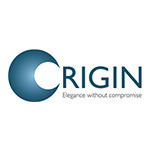 These innovative aluminium bi-fold doors from Origin benefit from a discretely designed frame, which allows for far greater glazing areas. To this effect, more light leaks through to your home. The innate properties of our premium aluminium profiles also retain heat in your home. 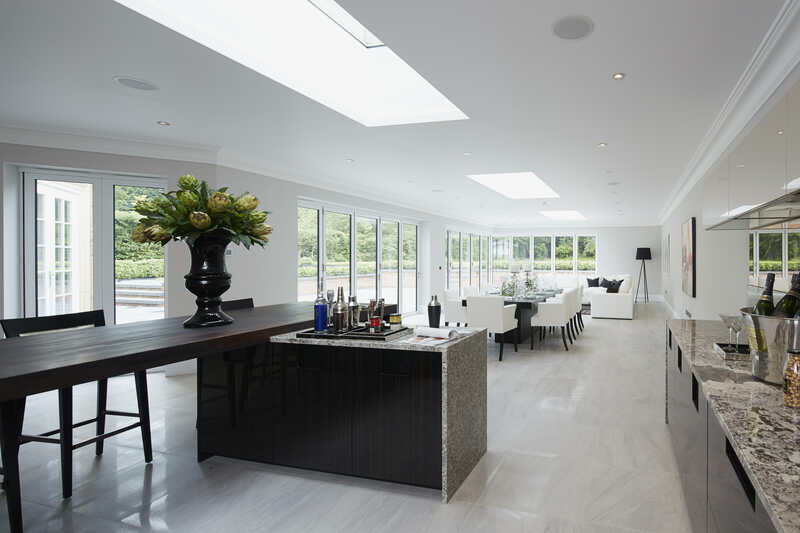 However, there is a wide calibre of features that constitute to a thermally-efficient home with bi-fold doors. 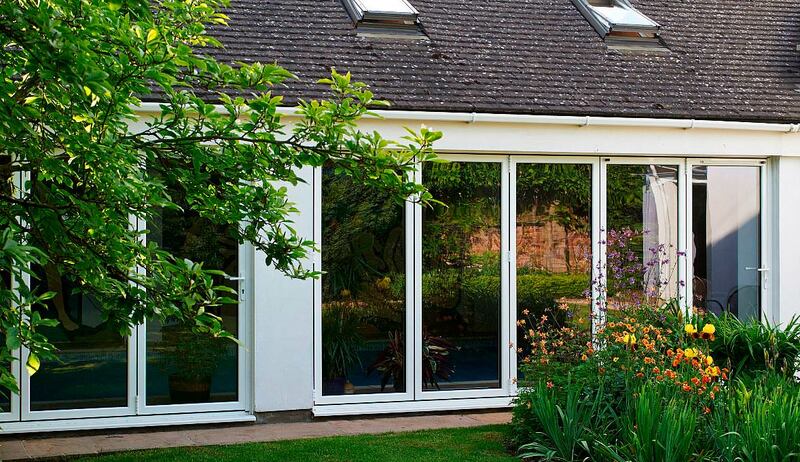 These bi-fold doors feature up to 28mm glazing for comprehensive storage of heat. The tight weather seals then intervene to prevent cold from making its way into your home. We would like to hear from you whether you have decided on which options you would like or are just contemplating the thought. Please get in touch with our customer service via the contact page and our experienced and friendly team shall act fast to give a response. If you have found the information you need and would like to start making a quote, please then visit out online quoting engine today, where you will receive a fast, competitive quote with no obligation to buy. 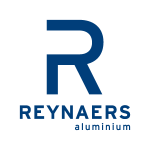 We believe that we are, arguably the most respected aluminium systems company in the world. This is because of our high-quality KAT manufactured Schuco aluminium bi-fold doors. 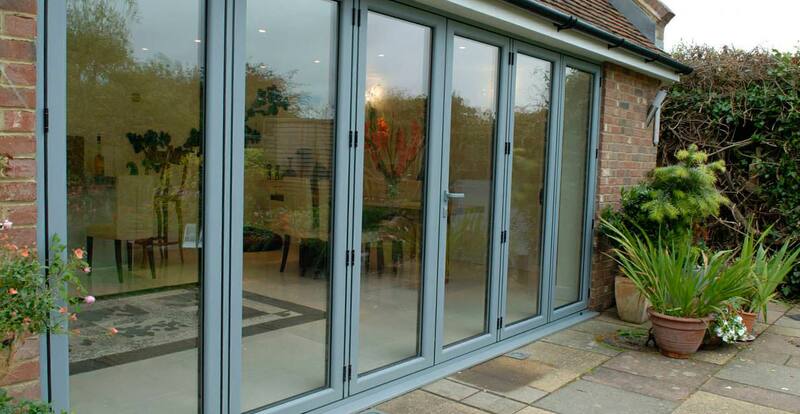 We provide high-quality world class aluminium bi-fold doors. As we are a globally recognised brand it is safe to say we offer impeccable aluminium bi-fold doors that can be made to suit your needs and your style. For a contemporary look, we offer blinds with glass. This is where integral Venetian blinds are fitted in-between the two panes of glass in our bi-fold doors. This contemporary design would add a stylish modern feel to your property. 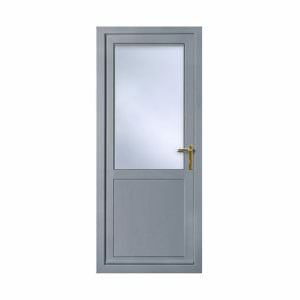 These are also fully customisable in order to fit seamlessly into your property we offer the option of 10 colours which are; White, Yellow, Hay, Sage, Sky, Cream, Putty, Silver, Dark Silver and Dark Grey. The blinds with-in the bi-fold doors are controlled via a rotational wand, rotational knob or a cord system. This option would be great for the person who wants to open up their property but still have their privacy. These blinds come with a 5-year guarantee and are fully compliant with the BSEN 13120 Safety Standards. Our aluminium bi-fold doors have a higher percentage of glass as they have been made with slim sightlines, this allows more light to come into your property. The biggest benefit of these doors is that they are incredibly low maintenance. The most you will need to do it to run a damp cloth over it when it needs it and regular checks of the track to avoid a build-up of dirt and grit. 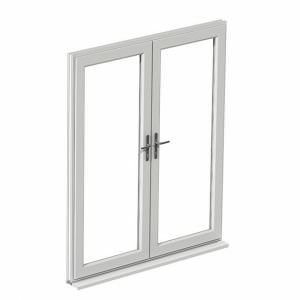 Because aluminium is considerably more durable than uPVC, this means that it is better as it will not warp or rot under the pressure of the elements. Our aluminium bi-fold doors are extremely secure; it is important to us that our aluminium bi-fold doors are not just stylish but they have substance. We believe that our aluminium bi-fold doors are only as good as the hardware used in them. This is why we use only the most durable quality roller and guide mechanisms. We also use the latest maximum security locks. This is because we care about our customers. We only use the best and most secure hardware- you deserve no less than the best. Before deciding on the colour of your aluminium bi-fold doors we recommend being sure to consider all aspects. You should take into account the look of your property, surrounding architecture and your other windows and doors. These can really change the colour you choose. We do offer a huge range of RAL colours but our standard colours are white gloss, anthracite grey and black. 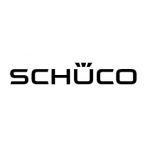 Enjoy the benefits of competitive pricing by getting a free, instant and highly competitive Schuco aluminium bi-fold door quote. Our online quoting engine makes it simple and easy. Alternatively, get in touch with us via our online contact form to speak to a member of our team. We’ll be more than happy to help you with any questions you may have. Raynaers aluminium bi-fold doors offer an innovative solution for homeowners looking to enhance their property with a cutting edge design, benefitting from all the benefits of high end thermal efficiency, security and product durability. The contemporary profile featured in these aluminium bi-fold doors allows them to offer superior standards of performance and design. Comprising of a sleek, modern aesthetic, Raynaer’s aluminium bi-fold doors offer more for any home. These aluminium bi-fold doors can be efficiently installed into both modern or traditional homes, offering an addition that is sure to complement all aesthetics. This allows all homeowners to enjoy their benefits, easily and stress-free. You can also opt for a range of opening configurations, meaning you’ll be able to make the most of the space that you have. 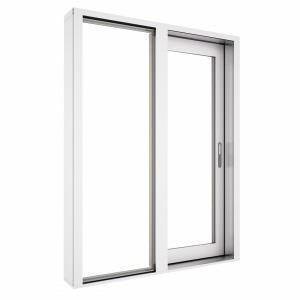 This includes open in and open out variants, ensuring you can tailor your new doors to the requirements of where they are being installed. By utilising the outstanding strength of premium grade aluminium, these doors ensure impressive standards of innate security. This allows you to enjoy peace of mind, knowing that your doors will keep you safe from would-be intruders. This exceptional strength is increased further by high performance, mulit-point locking systems. The Raynaer aluminium bi-fold door is available in a burglar resistant variety, specialising in reducing the risk of crime prevention with security reinforcement. Due to the signature design of aluminium bi-fold doors, you’ll be able enjoy a seamless connection to your garden or property interior. This is achieved with 90% of the door frame folding away to leave an impressive aperture behind. This not only offers unobstructed access and unrestricted views, it also allows for maximum ventilation. These doors are the perfect option for bringing space and light to any property, no matter where they are installed. To ensure a consistent and smooth operation with every use, the Raynaer aluminium bi-fold door utilises and integrated and centrally built-in bottom rolling system. This multi-wheeled hardware reduces wear and tear on your door for increased lifespan. This high performance hardware is specially designed to make sure the door opens and closes effortlessly, even after extensive use. With Raynaers aluminium bi-fold doors, you’ll be able to enjoy high quality that lasts. 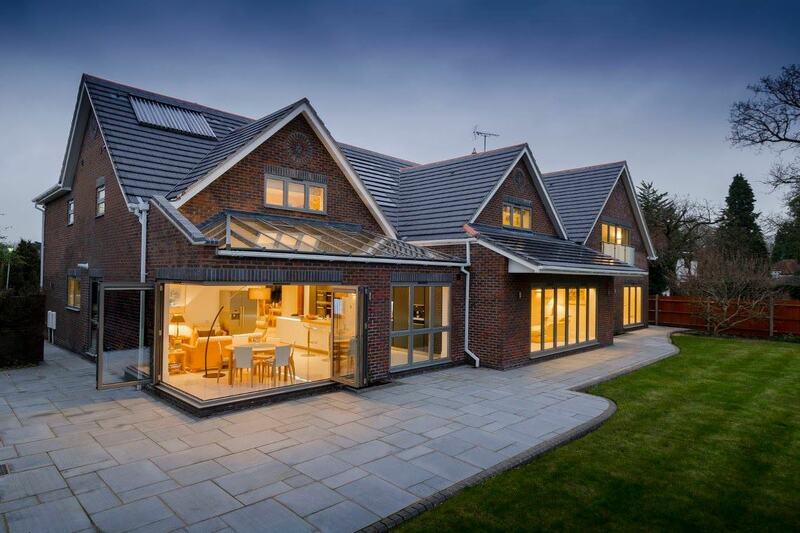 Offsetting the poor thermal efficiency properties of aluminium, this aluminium bi-fold door design utilises modern techniques to ensure warm air stays within your property. This ensures a warmer, more comfortable home throughout the year. As the heat retention of your home will be increased, you energy use will be decreased. Overall, this means you will notice a reduction in your heating costs, as well as a reduction in your carbon footprint. To get a free, instant and competitive online price for our Raynaers aluminium bi-fold doors, simply visit our online quoting engine. Alternatively, you can get in touch with us via our online contact form to speak to a member of our friendly team. We’ll be more than happy to help. As the market-leaders of aluminium bi-fold door design, Smart aluminium bi-fold doors allow homeowners to enjoy a premium addition to their home. 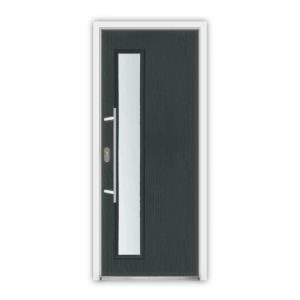 Offering exceptional standards of thermal efficiency, security and aesthetic, these doors are the ideal choice. Offering a stylish, modern aesthetic, Smart aluminium bi-fold doors will bring a modern flair to any home. They combine function and form to offer impressive standards of performance, thermal efficiency and security. The Visofold 1000 profile from Smart Architectural Aluminium utilises contemporary techniques to guarantee performance that is fully in keeping with modern demands. This means you won’t have to settle for less. Combining all the inherent benefits of premium grade aluminium with high performance design and hardware, the Visofold 1000 profile guarantees a warmer, safer home throughout the year. This makes them a perfect choice for both modern and traditional homes. These aluminium bi-fold doors feature a thermally broken, polyamide bridged frame to ensure the warm air stays within your property. This means it will remain warmer throughout the winter months, allowing you to notice an improvement in the performance of your central heating. Overall, this will reduce your energy use throughout the year. Smart aluminium bi-fold doors will allow you to enjoy lower heating costs as well as a notable reduction in your carbon footprint. Secure yourself the benefits, today. All Smart aluminium bi-fold doors are installed with high security, multi-point locking mechanisms that ensure an outstanding degree of home security. This allows you to enjoy the peace of mind that only high quality can bring. Due to the quality of aluminium that these doors use, they promise impressive standards of structure integrity. This means that the frame will effortlessly combine with the hardware to guarantee a standard of security that is consistent across the board. The choice of colours and finishes that we offer allow you to tailor your aluminium bi-fold doors to suit your tastes and property. This means that our doors can be suited to both traditional and modern homes. This includes the full Smart Sensation range, as well as any option from the RAL selection. All colours are applied expertly and uphold a durable finish that will ensure they maintain their fullness and richness for many years. These doors can be customised to open in a variety of ways, including open in and open out to enable you to make the most of the space that you have. You can also choose where you would like the doors to open from, including an option to have them out from the middle in a ‘curtain’ effect. You can also choose from a variety of panel number configurations, allowing our expert installation to ensure you get the perfect fit for your property. We’ll make sure your new aluminium bi-fold doors suit your property perfectly, guaranteeing performance and satisfaction all round. Visit our online quoting engine today to get a free, instant and competitive price for our Smart aluminium bi-fold doors. Alternatively, you can speak to a member of our team via our online contact form. We’ll be more than happy to help you with any questions you may have.